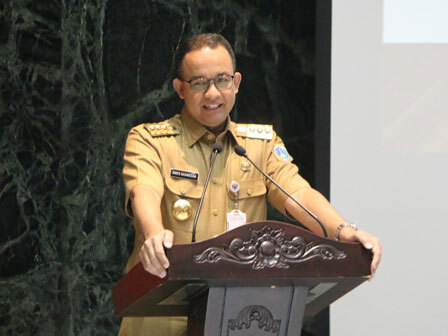 Jakarta Governor, Anies Baswedan welcomed the cooperation between Jakarta Provincial Government and the Corruption Eradication Commission (KPK) in optimizing the regional revenue. "I welcome the cooperation between city government and KPK in optimizing local revenue "
" I welcome the cooperation between city government and KPK in optimizing local revenue . As a results, last year's retribution tax revenue increased," he expressed, when he opened coordination meeting about regional revenue optimization with KPK at Balairung, Tuesday (2/6). Over the last three years, he added, the target of tax revenues increased. Even, last year's target of tax revenues and retribution has exceeded the set target. He uttered, cooperation with the KPK can prevent and minimize the occurrence of leakage in income and tax revenue retribution. "Jakarta has also formed the Corruption Prevention Committee whose main focus is preventing in income and revenue aspects, as corruption potential is rampant here, that's why it needs attention," he stated.